I moved to Washington in November 2007 and shortly after I started getting into hiking and mountaineering. I was a relatively new hiker, just learning about the mountains and gear and navigation and on June 21 2009 I went hiking on Mt Pilchuck to test out a bunch of new gear. It was a typical summer day in Washington with rainy drizzle and 45-50 degree temps. At about the 4000ft elevation of the trail I hit snow and the trail quickly turned into footprints going in all directions instead of an obvious trail. After some trial and error I found the correct set of prints that led me to the lookout. I arrived around 3pm. When I arrived at the shelter I was surprised to find another person up there. She was quite relieved to see me up there since she had been unable to find the trail down and was thinking she would have to spend the night there. I finished my lunch and told her we should walk down together. I gave her some extra gloves, trekking poles and snow shoes to help navigate the snow. However, about 20 minutes into our decent I lost the trail and we decided to head down and north and hopefully intersect with the trail again. Soon after that, the terrain to the north turned into a large gully and the terrain below us was too steep to descend any further. We were stuck and we did not want to climb back up and try a different route. I luckily had my cell phone which had low battery and weak signal but was able to call one of my friends that called the ranger station for us and suggested that I call 911. 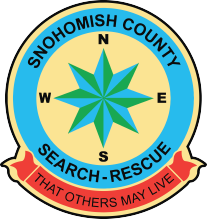 It was 4:00pm when I called 911 and before I could get the words out “I am lost on Pilchuck” the call taker was transferring me to the supervisor who was able to get GPS coordinates from my phone and activate SCVSAR and Everett Mountain Rescue. At 7:00pm I started to hear the helicopter and shortly after I could see them flying back and forth near our position but with the rain, fog, clouds and our position near the trees they were unable to locate us. When I called the 911 supervisor she said the helicopter could not see and that ground teams were on their way to our position. Hearing those words and the sound of the helicopter blades gave me a huge sigh of relief. For the next 2 hours we waited and tried to stay warm. I gave the woman I met an extra sweater and wrapped her up in a space blanket as she was starting to shiver. At 9:00pm we started seeing headlamps above us and started hearing whistle blasts. We were saved! We started ascending to the teams and shortly after we made contact with our rescuers. They did a quick medical assessment and determined that we were ok to hike out. On the way out I was asking many of the rescuers what kind of gear they had and what kind of training they go through to be in SAR. One of the members jokingly said “join SAR and we’ll teach you everything you need to know”. We made it back to the trailhead around midnight and shortly after I was on my way home. The next day at work I found out 2 of the rescuers worked at the same company as me so I started emailing them to thank them for their hard work. It also turned out that the member that said “join SAR” worked with me and he helped answer a lot of questions I had about joining and the different aspects of SAR. Another member also met with me in person and explained the different units, specialty teams and other aspects of SAR as well. Shortly after that I started a new project at work that didn’t allow me the time to join SAR. But in December 2009 I attended my first meeting and January 2010 I got my Department of Emergency Management number and became an official member and have been doing it ever since.